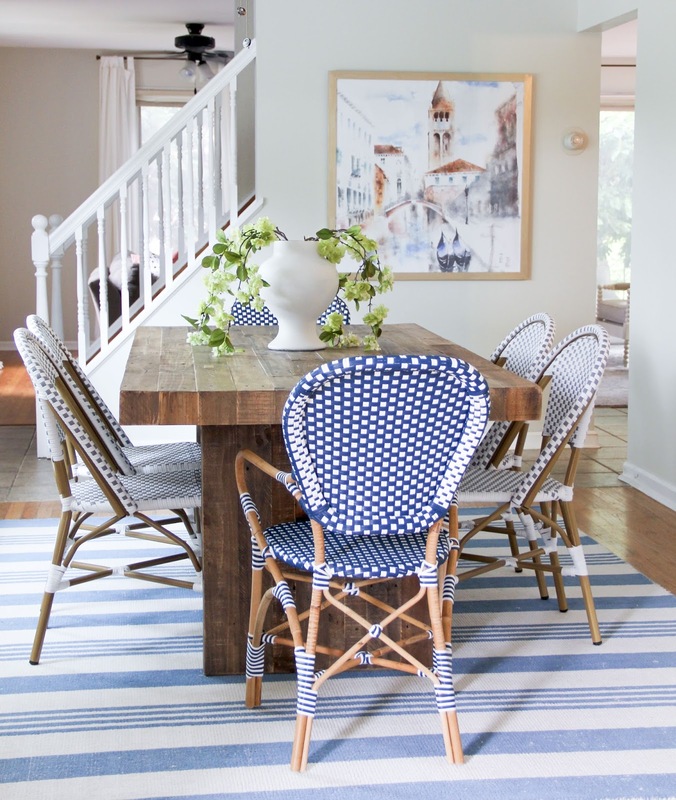 I am so excited to partner with Rugs USA to finally share my dining room with you! It has turned out to be one of my favorite areas of our home, and I have loved seeing it come together. Let me tell you, it was not easy furnishing this room. We ordered two different dining tables, one that showed up broken and one in the wrong color. 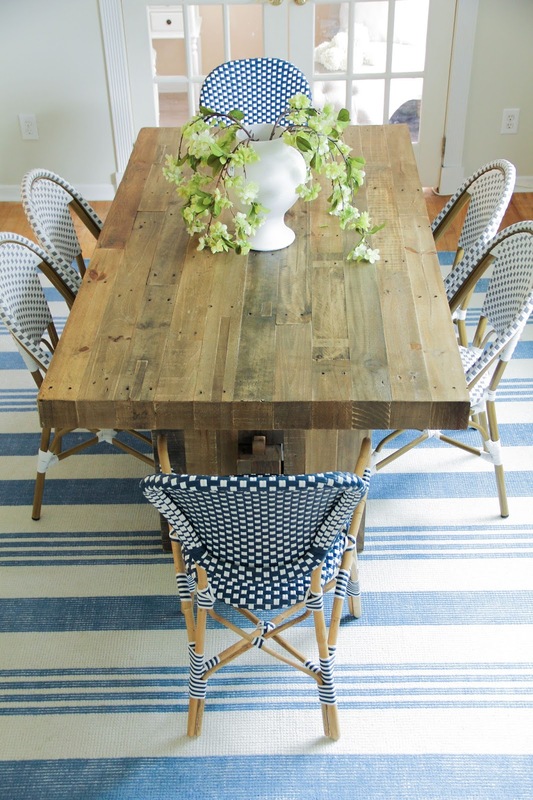 We ended up deciding on a whole new route, and chose this reclaimed wood table instead. I haven’t regretted it even for one second. Then came the chairs; what a fiasco that was, but I wont bore you with that story. I originally wanted to do white upholstered chairs, but figured with how messy my kids are when eating; that probably wasn’t the best idea. 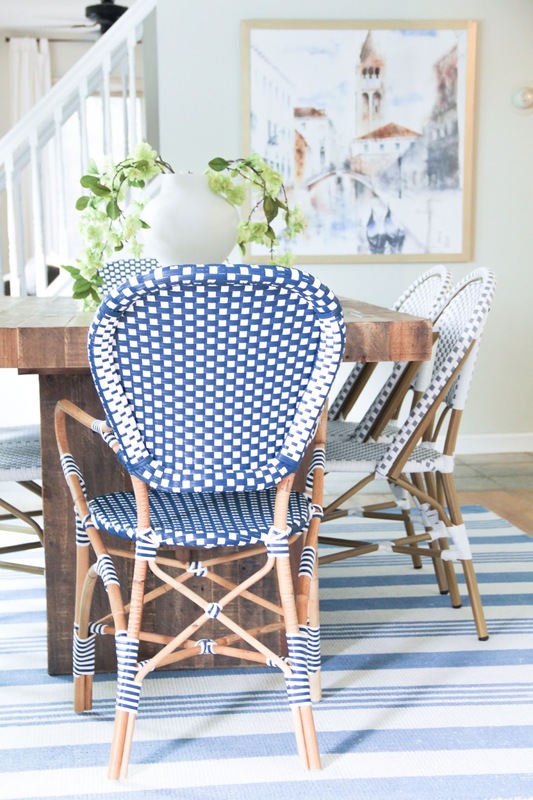 Nonetheless, I still wanted white chairs to help keep the room light and airy. 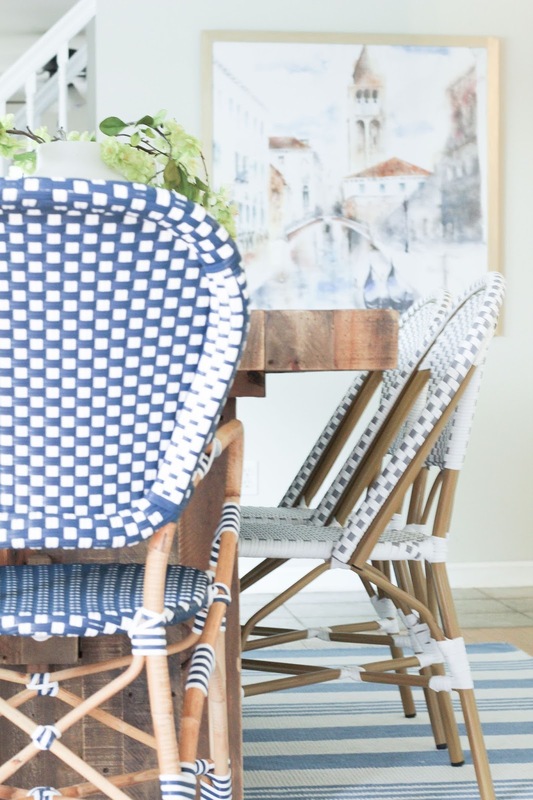 I ended up choosing these Serena and Lily french bistro chairs, and they are seriously the best chairs if you have kids. They are indoor outdoor making them durable, fade resistant, and they wipe up easily. Plus they are stacking chairs, so they stack up nicely when I’m needing to vacuum around the table. 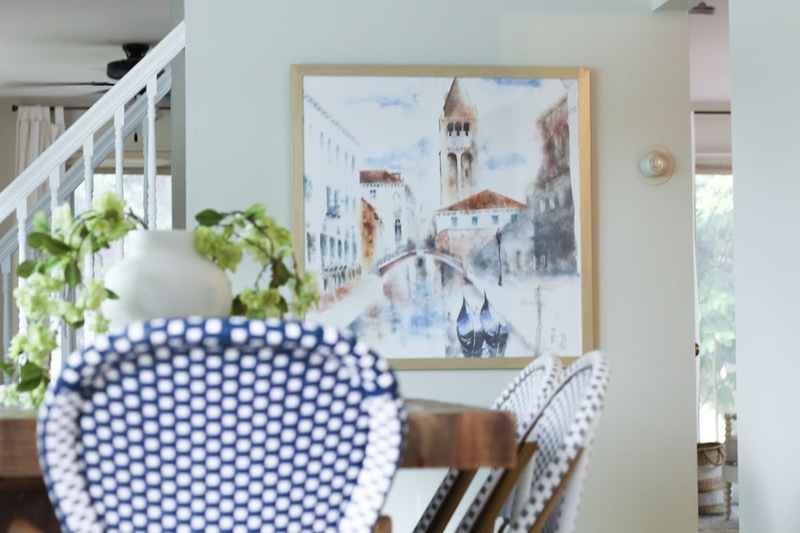 I would absolutely suggest them to anyone looking for dining chairs. 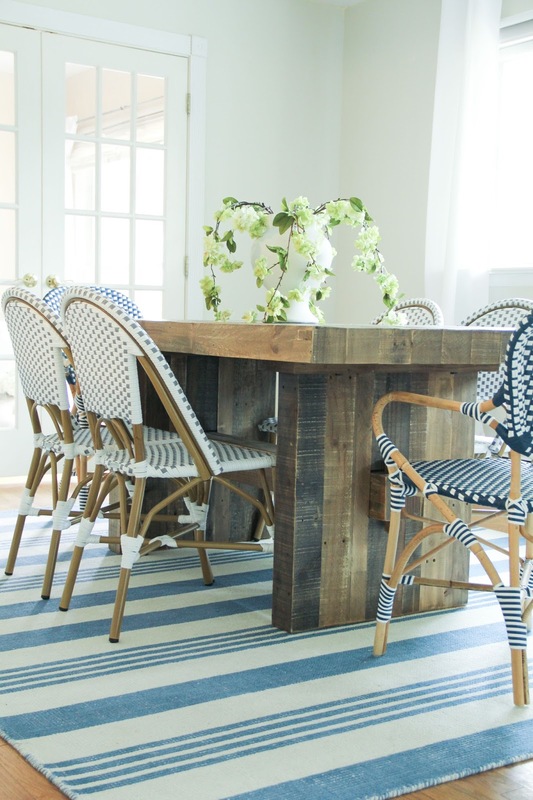 Now that I had chosen the table and chairs, I wanted a nice rug to tie it all together. After weeks and weeks, I found this darling rug from Rugs USA. I wasn’t sure it would work with my chairs, but once I saw it all together I fell in love. I love the way it brightens the room and adds a bit more color. I was worried it would stain easily, but it has turned out to be one of the best rugs we’ve owned. Stains wipe right up and never leave a stain. Its durable yet comfortable to walk on, and the perfect size for our table. I have no complaints, and hope you all love it as much as I do. DYING over these chairs (much better quality and cuter in person than the Safavieh style IMO)!